Hours of my life spent removing wheels, punching out bearings, adjusting stiffness of the ride. Time not dedicated on the mechanics was devoted to imagining new designs for the most exciting intersection of transportation and adventure! Do you remember the first hobby that allowed you to unleash your creativity, learn mechanical skills and prepare for speeds far exceeding those your unaided feed could provide? The effort, time and dedication – all for a hobby encumbered by the harsh New England weather several months out of the year. My first skateboard was a very used Vision Gator. As with most used decks, most of the graphics had worn off due to an appropriate amount of rail-sliding. The tail had been ground down exposing all seven layers of the plywood surface at a 45 degree angle. Likely this resulted from tail stops and efforts from the previous owner to learn how to jump manhole covers. There was a one inch long by 1/4 inch wide chip missing from the nose of the deck – undoubtedly the carnage from failed curb conquests. Even the grip tape was worn – peeling from the top side providing little traction. Moreover, as the glue lost integrity, this left a trail of breadcrumbs marking my tracks as little pieces of black sandpaper tore off with any aggressive shift in footing. It was far from perfect but it was cheap and it was mine! The winter of 1989 allowed months of work sanding the deck, removing grip tape and ultimately making efforts to reproduce Vision’s Gator graphics in vivid black and neon green paint. My hand not as steady as the original artist but the spring’s unveiling was an order of magnitude better than the late fall’s last ride. Eventually I would sell this deck and upgrade to a newer, flashier, better engineered board. Such changes would allow me to continue capturing excitement and feeding my creative passions. Is it a surprise that as a grown-up I’ve found motorcycles? 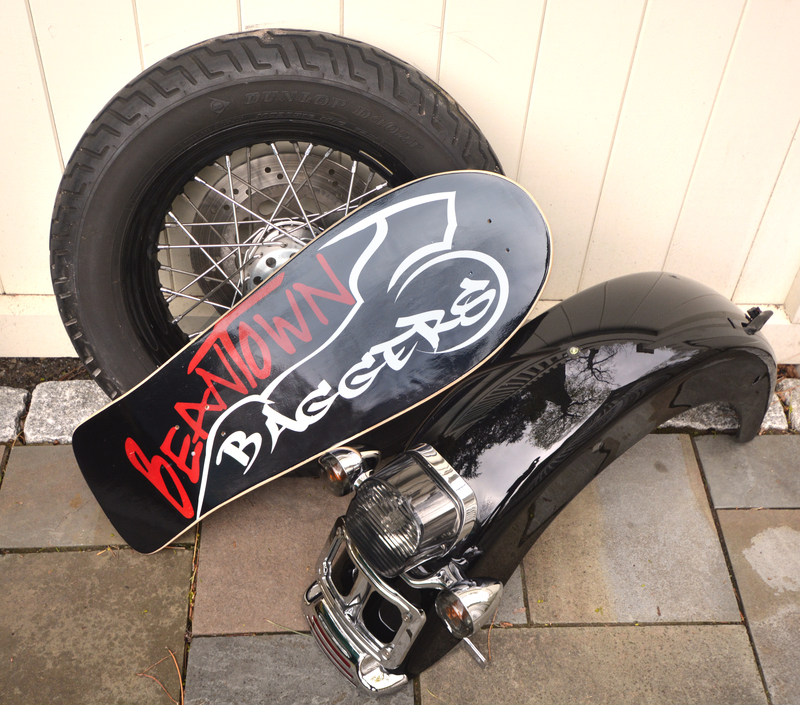 The similarities between skateboarding and motorcycles are endless. They both symbolize freedom – you can get just about anywhere without depending on the help of others to enable your journey. You ride alone but can do so socially – next to other riders if you choose. Creativity is limited only to the mind of the builder or rider. You become a part of the device as it becomes an inseparable part of you. You move, it reacts and the more time you spend together the more intertwined your action and its reaction become. Lastly, both hobbies have clearly identifiable subcultures, clothing, language and destinations that are frequented by members of the culture and often avoided by outsiders. After selling that original Vision Gator I went on to ride a dozen other decks (see the Mike Valleley Deck below), ruined many sets of Powell Peralta wheels and split countless Swiss Bearings. It’s hard to say if my skateboard promiscuity really allowed more enjoyment than a monogamous relationship with my first would have granted. Similarly, over the past decades many different motorcycles have found refuge in my garage. Each machine has been special in it’s own right. My mid-west bobber with a persistent oil leak marking it’s territory is reminiscent of the shedding grip-tape on my Gator. Or the Springer Softail adorned in a painted rendition of a tattoo forever marking my body – such a representation makes the separation of man from his machine unimaginable. As we journeyed through the years of our childhoods, we were all influenced by different experiences. Creativity was abundant and avenues to apply our vision were limitless. Adventure was confined only to our own imaginations and desire to feel speed was an invariable reality for almost all children. We all have a never-ending desire to build something functional, beautiful, freeing us to experience a life unshackled. No matter where we started or what compelled our first motorcycle ride, the one immutable fact is that we all ended up in the same place with an uncontrollable passion for motorcycles and all the creativity they inspire!